Oh hurray! It’s so good to be back to normal again. Don’t get me wrong, it was delightful to have a mellow visit with my parents, but to finally be well again is something I cherish very very much. Jeremy and I noted on our flight back to Denver that it feels like we’ve been in a twilight zone for the past month with the travel and the illnesses. I missed out on all of my typical holiday baking and I’m sure that means our local post office will start leaving packages in the backroom for months on end ;) Oddly enough, we here in Colorado are experiencing a “heat wave” of sorts. Seems we always have at least one week of warm weather every January. 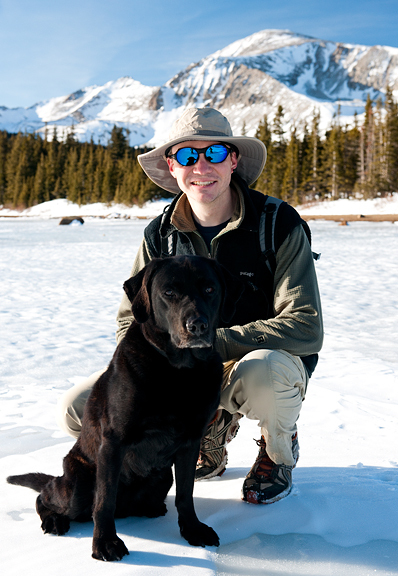 I’d rather have snow, but… I’ll gladly take a sunny day to walk with my guy and my pup in the mountains sans ground blizzards. As long-time readers know, I don’t do new year’s resolutions. I resolve to do things ALL THE TIME regardless of calendar date. That doesn’t mean I don’t have new year’s rituals like… The Changing of the Calendars (for some reason, I get very excited about this). The other thing I do is mark Chinese New Year on my new calendars because it always manages to sneak up on me and you need time to prepare those lucky foods and dishes for the celebration. The Chinese follow the lunar calendar which means all manner of headache for a completely westernized girl like myself. There are also those superstitions like not buying salt for the entire month after Chinese New Year (bad luck). Anyway, I marked it. It’s Valentine’s Day this year. I will make sure to have the appropriate goodies for the party which includes one of my favorite vegetables. I have been eating soybean sprouts since I was a wee bern. My mom and grandma would always buy a large bag of them from the Asian market and open the bag up in the middle of the kitchen table where we would gather around plucking the tiny ends off the sprouts. It wasn’t until I got to college, bought a bag and began picking the ends when a roommate informed me that she doesn’t bother plucking the ends off. Well, that certainly saves time! I think it’s a Grandma thing, because last week when I was at my parents’ house, I noticed Mom hadn’t picked the stringy ends off either. I don’t clean the ends anymore, except on Chinese New Year’s Eve – otherwise I’d get a little stabby. I still haven’t found soybean sprouts in western markets, so I generally have to make the trek to Denver to get mine which means we don’t eat them very often here. They aren’t the same as mung bean sprouts, which everyone seems to carry (I like those too, but in different dishes). 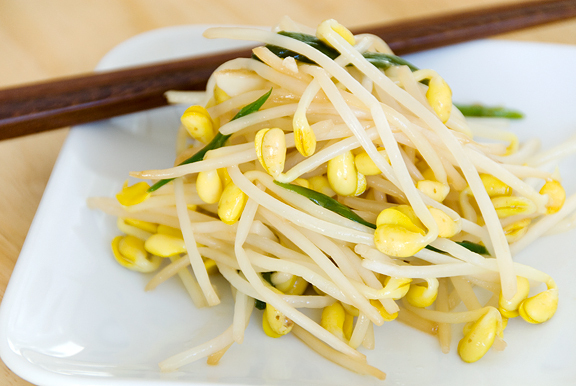 Soybean sprouts have that crunchy yellow bean at the end which lends to great texture as well as a mild and subtle nutty flavor. My favorite way to prepare them is very simple. Some vegetable oil, minced garlic, sliced green onions, sprouts, a pinch of sugar, and soy sauce. That’s it. The sprouts are satisfying without being overly heavy. I just love to munch on them. In fact, when I was little I had seen a nature show on manatees and whenever I ate these soybean sprouts, I pretended I was a manatee chowing on random vegetation in some lagoon. I never divulged this information to anyone until now. This dish is always on the menu come Chinese New Year because the sprouts represent… money. Is it me or does practically everything on a Chinese New Year menu represent money?! 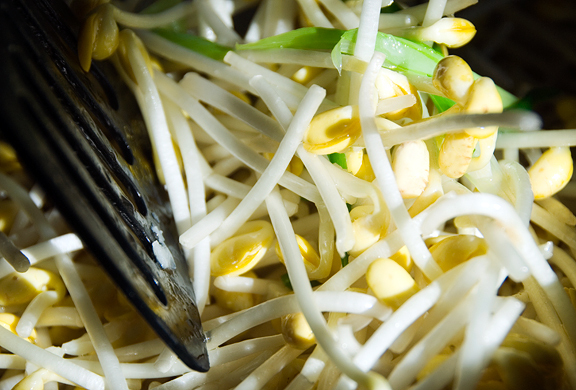 Regardless, these soybean sprouts make a lovely dish to serve any time. And when you crunch down on a mouthful, just close your eyes and pretend you’re a manatee. 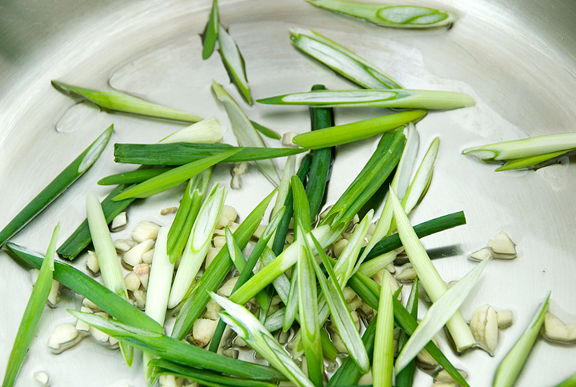 Pick the stringy ends off the soybean sprouts (optional). In a large sauté pan, heat the vegetable oil over high heat until hot. 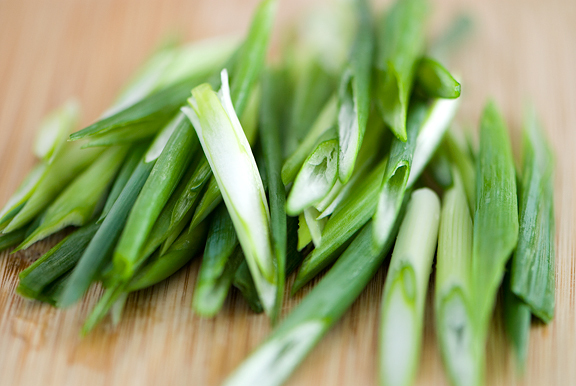 Toss the garlic and green onions into the pan and stir until fragrant. Add the soybean sprouts and sauté for about three minutes. Pour in the soy sauce and add sugar to taste. Stir everything together, reduce heat to medium-high, and let simmer for a few minutes until the sprouts turn a little translucent. Serve hot. I havent tried these sprouts before but this looks great! And what a colorful dish too. I can actually find these around here! So exciting. I’ll get a bag and give this a try. Looks marvelous. Isn’t the warm weather odd? We went x-country skiing yesterday sans gloves and hats and I told Mr. B that it felt like Spring! 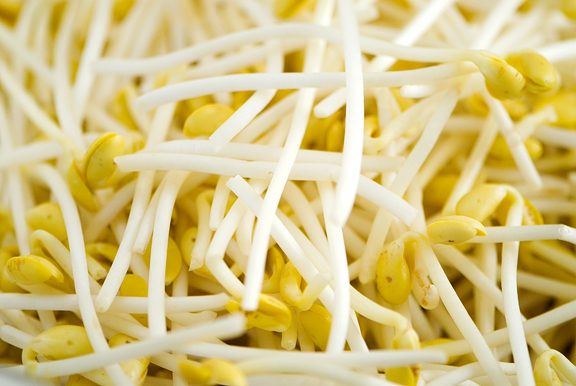 I’m glad you mentioned mung bean sprouts, because they look similar and otherwise I was going to be confused about whether soybean sprouts are the kind that seem relatively easily available. I wonder if you could grow your own soybean sprouts? Supposedly sprouts are pretty easy to grow, although I don’t know that sprout-able soybeans are going to be easier to find that already sprouted soybeans. my mom always made a yummy banchan with soy bean sprouts. this sounds amazing! Just saw your pics from Williamsburg and I have been to that cheese shop many times! Love it. I have a real soft spot for the candy shop there. Love the chocolate covered strawberries. They are huge! Glad you had a nice visit. It’s been much colder here than usual too! hee hee, manatee… these look delicious, and I will attempt it if I find fresh sprouts anytime soon (not a staple in WV). In the meantime, I will also think about my mom’s bean sprout soup, yum. I don’t think I’ve ever seen soy bean sprouts Jen. Plenty of mung bean ones. I must check out the Asian stores near here. Like Bridget, I was also wondering about growing them. Manatee was knew to me so I googled it. I think they might be the same as what we have here called dugong…although I’ve yet to see a dugong. I’m sorry, I absolutely hate soybean sprouts. I can’t grasp why. Probably something with the taste. We can’t like everything right? Never seen the sprouts around here but now I want to try them! Manatee sprout mania! Looks yummy. The pictures on your posts are some of the best parts. :) “Heat wave,” huh? thanks for the inspiration on this one. made something wholy different but related and linked to you. Oddly, I have never heard my mum mention bean sprouts as a symbol of wealth/money all these years! I will have to check this out with her! One could tell that your sprouts remain very crunchy after the stir-fry! wow, I am so surprised to see your recipe. This is the everyday banchan(side dish) in my country, Korea. It’s so easy to make. and it’s really tasty. Quite a simple dish but it is so good! I recently discovered the joy of eating soybean sprouts. I remembered about mung bean sprouts but completely forgot that a soybean sprout existed to enjoy. So good! Love the crunchy and flavorful yellow end. So glad that you are feeling better. It is COLD here in NE PA! I usually head out skiing at 8 am, but it was 10 degrees & windy, so I made pancakes. :-) Waited until 10:30 when it was a very civilized 20 degrees. I’ve never seen soybean sprounts. Do you think it would be possible to sprout them yourself? I can’t imagine why not. I think I’ll try. Huh… I always thought mung bean sprouts and soybean sprouts were the same thing, only that they allowed the bean to mature on the soybean ones… I guess that’s because they’re called practically the same thing in Chinese. And actually, we used to pull off the ends off these too. But then we got lazy and stopped doing it. I still prefer it without the ends but it’s tedious and takes time away so I get impatient and skip it more often than not. 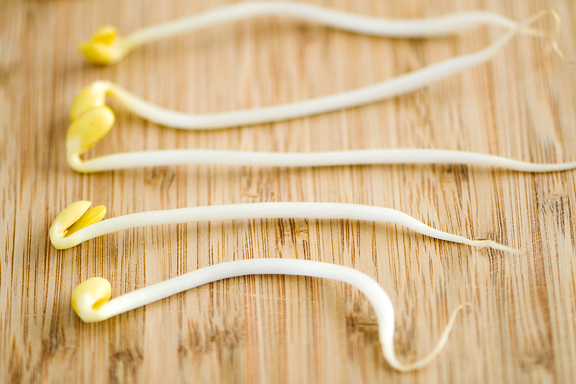 If soybean sprouts are hard to get over there, why not sprout your own? There seem to be quite a few guides online for doing it. Don’t worry. When I was younger (say, ten years ago) I would pretend I was a long-necked dinosaur as I munched on strips of dried seaweed, holding them as if they were the leaves of a tree. I’ve always had an aversion to sprouts, but I really love the simplicity of this. 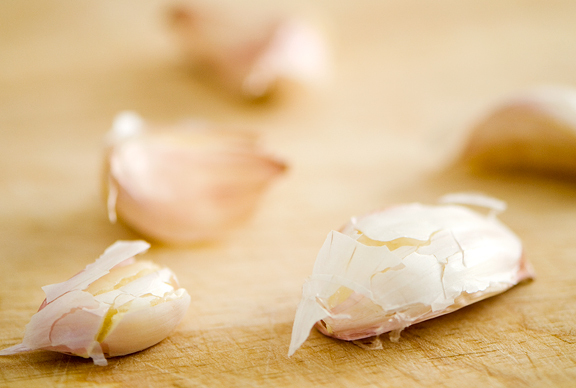 And anything with garlic and green onions is amazing. And it doesn’t exactly hurt that soy bean sprouts mean money, either. I really want to try this! It sounds like an incredibly simple side dish for many things. I’ll check out the stores when I go up next time. Funny, I finally found my Mom’s old seed sprouter, and have been looking all over town for a source of seeds to grow sprouts from. I used to have all kinds of food/imaginary play associations, and still indulge fairly often. My best friend’s Mom was really good with it, and used to insist on certain things like “those are not frozen blueberries, those are snake eggs!” and nothing you could say would convincer her otherwise, so you had to go along with it. Wasn’t today’s weather AMAZING? 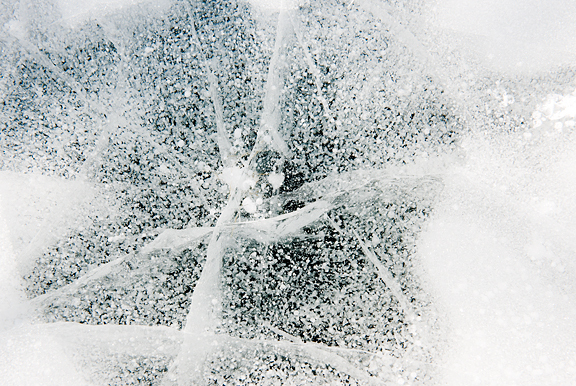 Glad you went and enjoyed it–you’ll get your snow on Thurs. SO looking forward to your Chinese New Year dishes! I love that you shared with us that you pretended you were a manatee! And I love your photographs, as always. I imagine that Kaweah was very happy to have you home. Glad you’re feeling better. Love them! Grew up eating them in the same salad my mom used to make all the time with rice and tomatoes, soy bean sprouts and vinaigrette. Kinda weird combo but we loved the crunch! You guys got warm and we got cold….go figure!! I’m glad I did Costco yesterday & saved grocery shopping for today. I’m on a mission to get London House Steak Sauce, roast beef, cheese & some good bread! Can’t wait for lunch. Thanks for the link to the sauce recipe. OH, YES!! Simple and yet delish!! What a classic!! I love your energetic and dynamic spirit. I am so glad you are into soy bean sprouts, which is made from soy bean the only vegetable/plant food has complete protein (9 essential amino acids) as good as any animal protein. My soil microbiology professor said that you don’t have to add spice/sauce to make this dish taste good, b/c during soy bean germination, it releases all kind of enzymes which are just natural food enhancers. Oops, I posted my comment on the wrong page. Here is an article on how to grow sprouts (soybean and others). It may be useful (or not) for you snow dwellers. Aside from Chinese, if you pooled all the cultures together- it would be, like, everything, right? Bridget – you probably could, but the yield to make one dish would have to be pretty substantial. Barbara – I’ve seen them in the Sydney markets, which makes me think you may be able to find them where you are? Keep an eye out at your Asian markets? Manatees are very gentle creatures – so sweet. Jennifer – Colorado has a reputation for snow, but we also get 300 days of sunshine a year. It rocks! Rebecca – thanks! Just a month away! Ruth Ann – thanks for the link! I’m sure it will be helpful to all of these eager sprouters – very cool! Hi, I found your site as I was looking for ways to cook soya bean sprouts. I have actually just sprouted my own soya beans and made sprouts, I noticed you said you had no where to buy them. If you order organis soya beans from the internet, you can sprout them easily at home!